Apple has patented some weird stuff in the past year—remember Bag, the foldable phone, and the phone that’s all screen? Yet its latest application puts even those strange ideas to shame. Get ready, Congressman Duncan Hunter: Apple just filed a patent for a vaporizer. The patent, filed in July and published yesterday, describes a “sublimator/vaporizer,” and was first noticed by Digital Trends. It carries both Apple’s name and that of company engineer and senior manager Tetsuya Ishikawa. Ishikawa has a history of filing patents related to heat creation and management, so a chamber for vaping as-yet-unknown materials seems right up his alley. 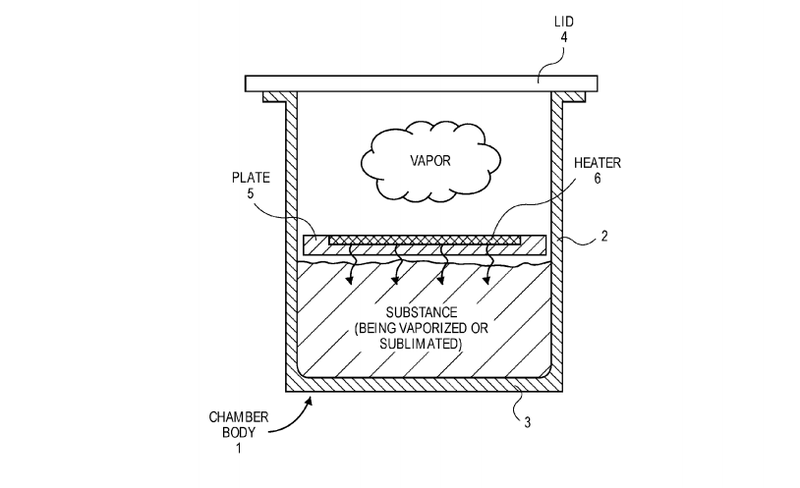 The patent documents describe a chamber that uses a heated plate to slowly compact the material being vaporized. This could potentially solve a problem with the bowls of many popular vapes today: If your bowl is packed incorrectly, you wind up with uneven heating and a lot of wasted, unvaped material that necessitates a quick stir midway through a smoke session. It’s not clear from the filing what substance is actually intended to be vaporized in the device. (It could, for example, be used in certain industrial and medical settings.) At the moment, however, the most common vaporizers in Apple’s wheelhouse—the consumer electronic market—are recreational vapes, and the substance often used in a recreational vape is weed. While we have no idea what Apple intends to do with its vaporizer—and it’s well worth noting that this is just a patent, and may never see the light of day—California, where the documents were filed, legalized recreational marijuana use last year. There is, at least, some history, at least, with other kinds of vapes: Vape company Firefly was developed in part by a former Apple employee. We’ve reached out to Apple to ask what they have in mind for the vape, and we’ll update if we get a response.